I recently came across a fascinating book chapter that I think has relevance to hara development. Its subject is Noh, a classical Japanese dance theater tradition. Noh is characterized by slow, deliberate, highly stylized movement. The actors wear masks, which cover their facial expressions. While there are spoken words in Noh, emotions are also conveyed by the masks and by movements and bodily gestures. Umewaka goes on the explain how the key to expressing emotion in Noh lies in the breath. Noh performers realized centuries ago that they could convey emotional expression by altering their breathing rhythm and that subtle changes in breathing can have tremendous impact on the audience. To illustrate this, he talks about the kamae (which he translates as “posture”) in Noh. 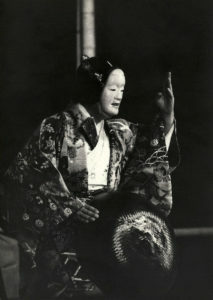 While the basic kamae is simply being “motionless on stage”, the actor must convey specific emotions in that stillness. Those emotions are created by internal changes—that is, by changes in breathing. Further, he makes the case that although an amateur may be able to mimic the external form of a Noh gesture, he could not truly reproduce it because he would lack the proper internal control. Umewaka does not use the word “hara” in his chapter. Nor does he describe the types of training methods required to develop the type of breath control required for Noh, other than to say that it comes after “long years of aestheticism”. However, I strongly suspect that hara breathing plays a significant role in Noh. I base this largely on watching Umewaka in action as a performer. A wonderful example of this is his TED talk in which he demonstrates some traditional Noh scenes. If you watch carefully, you’ll see that his lower abdomen is expanded throughout the performances. Further, his movement emanates from his lower abdomen. His movement is akin to that of a highly skilled Japanese martial artist with well-developed hara breathing. Umewaka’s comment about an amateur not being able to reproduce a Noh kamae has implications for hara development. Kamae play significant roles in Japanese martial arts. While Umewaka defines the term as “posture”, the concept was originally described to me in karate as a “ready stance”. My Zen teacher also used to speak of kamae in mind/body terms, including not only posture, but the mental state of relaxed alertness as well. A proper kamae should be felt by an opponent. But, for this to happen, the breathing must be correct. Just as in Noh, it is possible for a martial artist to copy the superficial physical form of a kamae. I know this because that is what I did for many years. Now, I see it all the time in beginning students. But, mimicking the external, physical aspects of a kamae does not have the same impact on others if the person is not breathing from the hara. 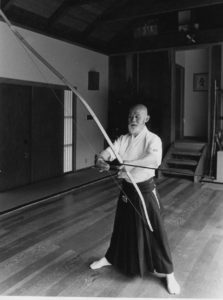 Let me give an example from kyudo, the “Zen Art of Archery”, an art I have studied for over 35 years. I can easily explain to a beginner the form of the basic kamae; for example, the feet are about one and one half shoulder width apart, the bow rests on the left knee, the elbows are bent making a rounded shape (in Japanese this is referred to as “like grasping a tree trunk”). And, it doesn’t take too long for him or her to mimic the stance. But, it wouldn’t quite look right. Typically, the beginner will look top-heavy due to unnecessary tension in their upper body. More importantly, they will not have impact on people watching them. In order to take the tension out of their upper bodies, they have to learn to breathe from the hara. And, with that comes a transformation in the way they hold themselves. The center of gravity drops, they appear firmly rooted. The muscles in their upper bodies appear relaxed and alive. And, they convey an air of relaxed alertness that spreads to other people watching them. A kamae properly executed—both internally and externally—should put the viewers into samadhi.